PLAN AHEAD ON SATURDAY: Fans are highly recommended to plan extra travel time and to arrive at stadium gates early due to increased security procedures. The Black Knights and Midshipmen battle for the 119th time in the Army-Navy Game, presented by USAA, at Lincoln Financial Field in Philadelphia. Army's 2018 uniform honors the soldiers of the 1st Infantry Division. 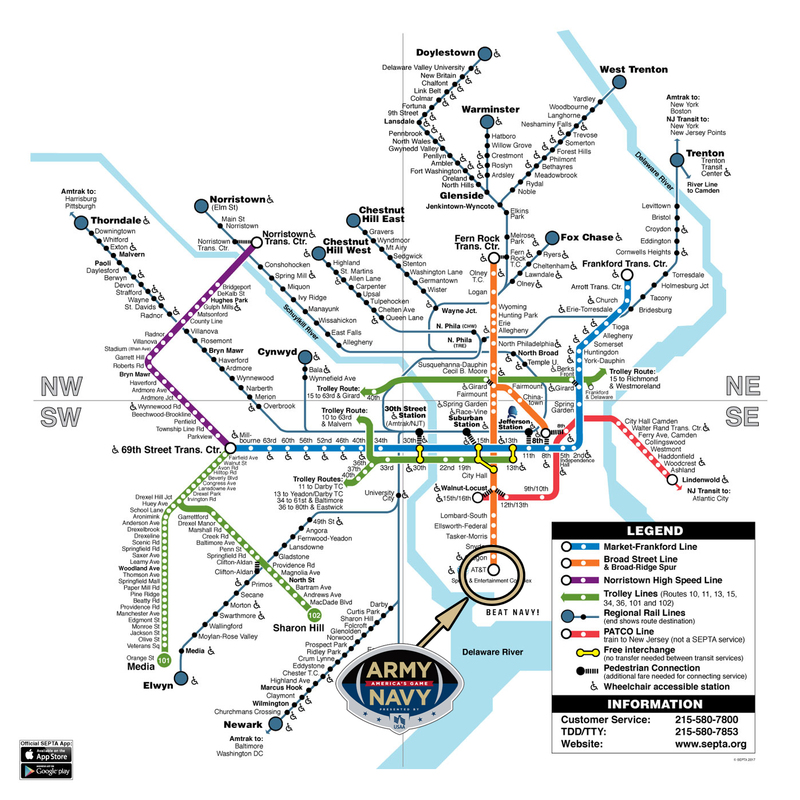 PUBLIC TRANSPORTATION: The fastest way to Lincoln Financial Field is south along the SEPTA Broad Street Subway Line. Exit at the last southbound stop, Pattison Avenue. WILL CALL TICKET WINDOWS: Opens at 10:30am. Pick up all will call tickets at the Lincoln Financial Field Ticket Office, located in the Xfinity Gate on the north side of the stadium. STADIUM GATES: Open at 11:00am. SIRIUS Satellite Radio Sirius Channel: 138; XM Channel: 202; SIRIUS Internet Channel: 969. Tunein App (free) through Apple or Google. 6:30am - Tailgating & Parking Lots Open: Fans can set up their tailgates when parking lots open at 6:30am. Tailgating is NOT PERMITTED in the following lots of the sports complex: T, U, S, V, W, X, R, Q and the Naval Hospital Lot (20th & Pattison). 9:00am - ESPN College Gameday: ESPN's signature college football show will broadcast live from 9am to 12pm at Xfinity Live!, located at the corner of Pattison Ave. and 11th Street. 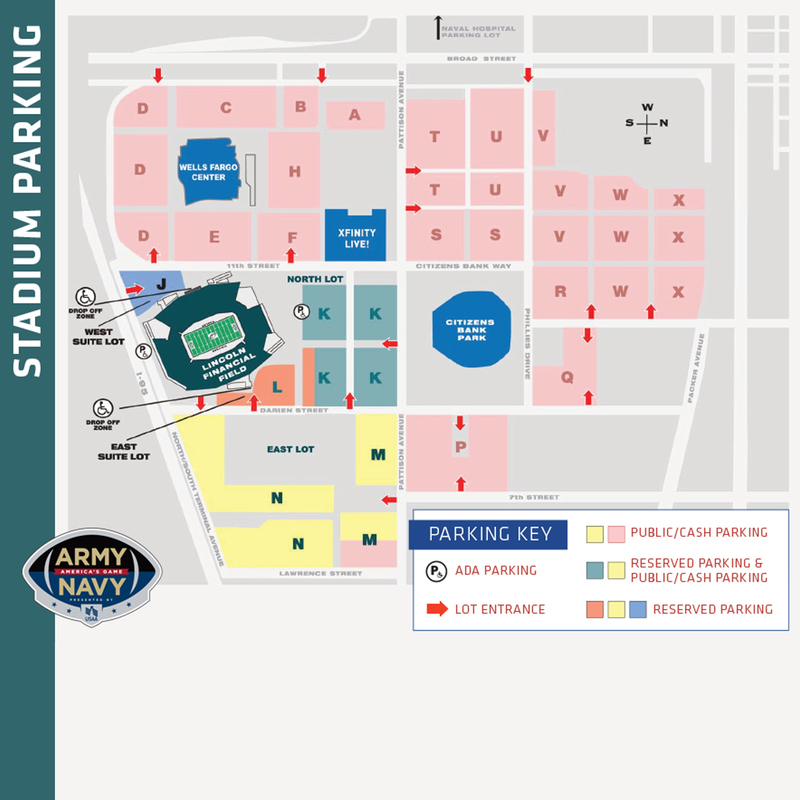 11:00am - Army-Navy FanFest: Fans are encouraged to stop by the Army-Navy FanFest located at HeadHouse Plaza, featuring gameday entertainment, interactive displays, and live pregame shows. 12:41pm - Army March-On: Watch the Corps of Cadets march in a time-honored procession into Lincoln Financial Field. Army will march-on at 12:41pm. As a reminder, there is NO RE-ENTRY to Lincoln Financial Field for fans wishing to enter for the march-on and re-enter at a time closer to kickoff. 2:49pm - Parachute Demonstration: The Army Golden Knights and Navy Leap Frogs will thrill the crowd with their precision and style as they parachute into the stadium (weather permitting) prior to kickoff. 3:10pm - Kickoff: The Black Knights and Midshipmen kickoff the 119th playing of the game! Parking in official lots is $45 per car. Parking for oversized vehicles is $85. Prices at private lots may vary. Fans with an ADA license plate or placard will be permitted to park in handicap-accessible locations, as available. Parking options are limited, fans are encouraged to carpool or take public transportation to the stadium. The fastest way to Lincoln Financial Field is south along the SEPTA Broad Street Subway Line. Exit at the last southbound stop, Pattison Avenue. Lincoln Financial Field is a short walking distance from the station. 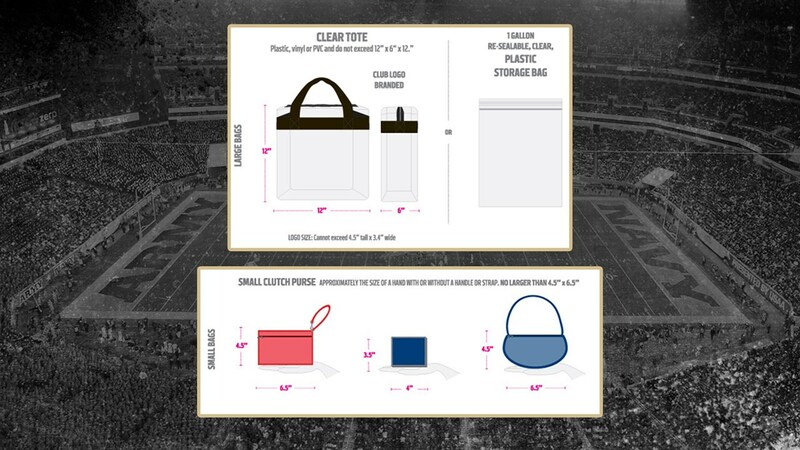 To provide a safer environment for the public and expedite fan entry into Lincoln Financial Field, there are limits on the size and type of bags that may be brought into the stadium. Bas that are clear plastic, vinyl, or PVC and do not exceed 12" x 6" x 12". One-gallon clear plastic freezer bag - ziploc bag or similar. An exception will be made for medically necessessary items after proper inspection at a gate designated for this purpose. Prohibited items include but are not limited to: coolers, briefcases, backpacks, fanny packs, cinch bags, seat cushions, computer bags, binocular carrying cases, camera bags and luggage of any kind or any bag larger than the permissible size and of a different type. FRIDAY | 8:30am - ROCKY RELAY (Steps of the Philadelphia Museum of Art) : As the sun rises, so do the Cadets and Midshipmen as they run a relay up the famous "Rocky Steps". Strength and speed will be tested and only the winners can say, "Yo, I did it!". FRIDAY | 10:00am - LEADERSHIP REACTION COURSE (Independence Visitor Center) : The Leadership Reaction Course will be revealed to the participants at the start of the challenge (leaders receive a mission, brainstorm, execute, and readjust to complete it under a time restraint). The course includes mental and physical obstacles that can only be overcome with leadership and teamwork. FRIDAY | 12:00pm - PULL UP CHALLENGE (The Shops at Liberty Place) : Amid the cheering and pep bands at the official Pep Rally, the cadets and midshipmen have to concentrate and complete as many pull-ups as possible. FRIDAY | 3:00pm - TUG OF WAR (USS NJ Battleship - Camden, NJ) : On the deck of the USS NJ, the Cadets and Midshipmen will battle it out with a tug of war competition. Experience the Battleship New Jersey, America's most decorated Battleship and one of the area's most exciting museums. SATURDAY | 1:15pm - STADIUM OBSTACLE RELAY (Lincoln Financial Field - Game Ticket Required) : It all comes down to gameday and a Stadium Obstacle Relay to determine this year's Patriot Games champion. Go Army! Beat Navy! FRIDAY | 12:00pm - ARMY-NAVY PEP RALLY (The Shops at Liberty Place) : With only 24 hours until game time, the pep bands, cheerleaders and fans get fired up at the official Pep Rally!